Bread is a funny thing. It’s the stuff of life and the one thing I probably couldn’t live without, but the thought of making it at home fills me with dread. Maybe it’s the time and effort you have to put in which, in an instant, can all be for nothing – a minute too long in the oven, a forgotten pinch of salt, so many little things that could be fixed in cooking are irreparable when you’re baking. 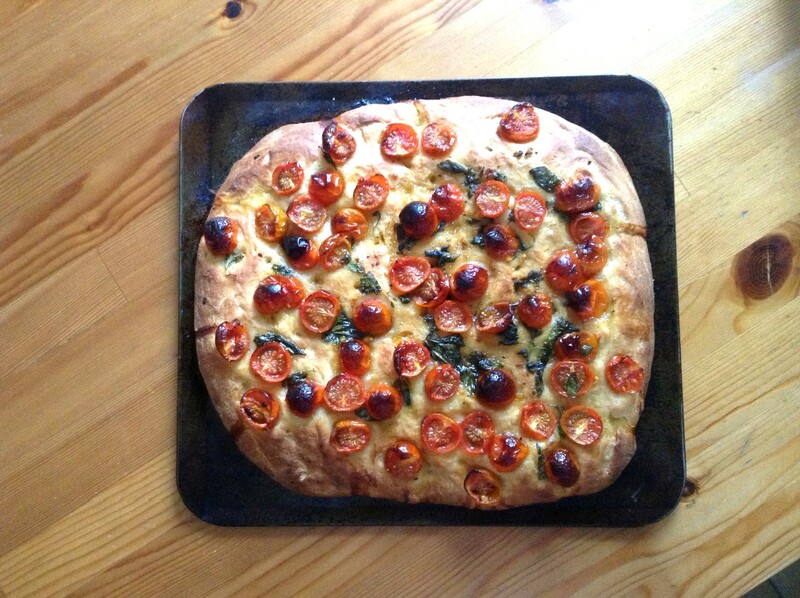 The first time I made focaccia was for my Italian picnic sandwich, and while it was ok, it was by no means a success. It might have been, but then I got distracted and the top got totally burnt while the inside was completely overcooked and dense. We still ate the bottom and it was ok, but it didn’t fill me with confidence for trying it again. Nevertheless, try it again I did and boy am I glad! I did use a bread mix, but I don’t consider that 100% cheating, especially for a novice bread maker. Plus, the first time was with a mix as well and that went totally wrong. There was nothing difficult about this. I followed the pack instructions − with the addition of a decent pinch (or small bucket) of salt which they somehow omitted − and, rather than proving it right then and there, I put it in the fridge and let it prove overnight to be baked the next day. The topping, which could be made with any mixture of things, I quickly threw together and topped the dough with in in the final proving stage. While baking my husband went running and screaming into the kitchen shouting about fire and death and generally making out that the world was ending. With the aim of saving you from this heart-stopping scene, I will warn you now that it may smoke and steam a bit in the oven. Just keep an eye on it so it doesn’t burn. The crusts did get a bit crispy, but these can easily be trimmed off before serving. This bread was light and moist and the tomato and basil topping was so delicious. It’s like a pizza, but without most of the guilt. Vegetables, herbs and a bit of fluffy bread, no heavy cheese or sauce; just freshness. This is definitely a crowd pleaser and, besides the time for letting it prove, it is easy as pie, even easier than a pizza pie! 1. Follow package instructions to make dough with the addition of salt. 2. Knead for 10 minutes until smooth and elastic. 4. 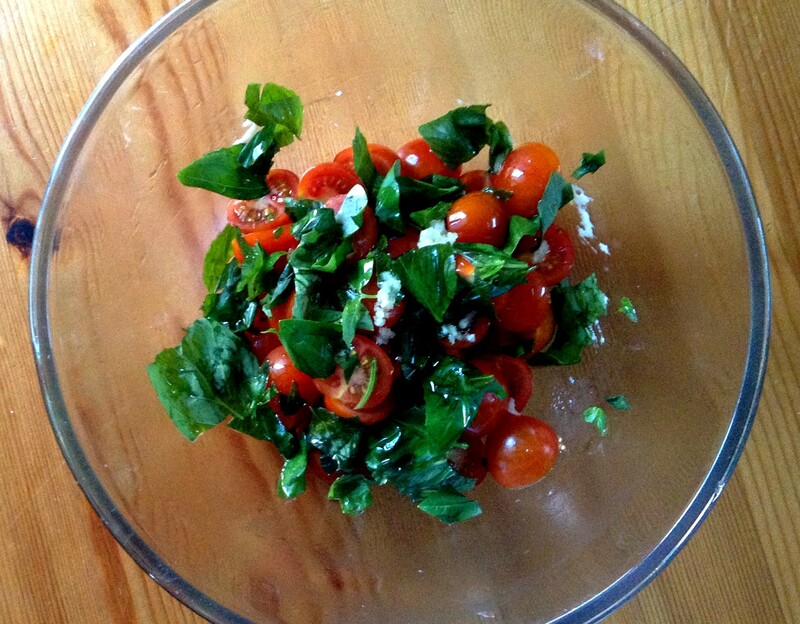 Mix together tomatoes, basil, garlic, oil, vinegar, salt and pepper and set aside. 5. Press dough out onto the baking sheet into a rectangle about 1 inch thick. Poke your fingertips all over the dough to create those delicious nooks and crannies which will hold the oil and tomato juices in little puddles of flavor. 6. Top the dough with the tomato and basil mixture and cover with oiled plastic wrap to prove for a further 20 minutes. 7. Place into a hot oven (400ºF or 220ºC) and bake for 20-25 minutes until browned and cooked through. For the last five minutes, I slid the bread straight onto the oven rack to get more heat to the bottom which seems to cook slower than the top, but this may just be my oven. Did you use the bee timer? It looks really yummy! Nothing wrong with a little dark crust! And who can pass up pizza without the guilt! I use the bee timer all the time! Beautiful. I too fear bread making, but this looks lovely. Good job! Thanks, it was far too easy to be scary! Bread mixes are the savior of the novice bread maker, definitely. This looks so delicious! I really need to try bread making! It was so tasty and with a mix it’s pretty much a no brainer, but looks super impressive. Try it! 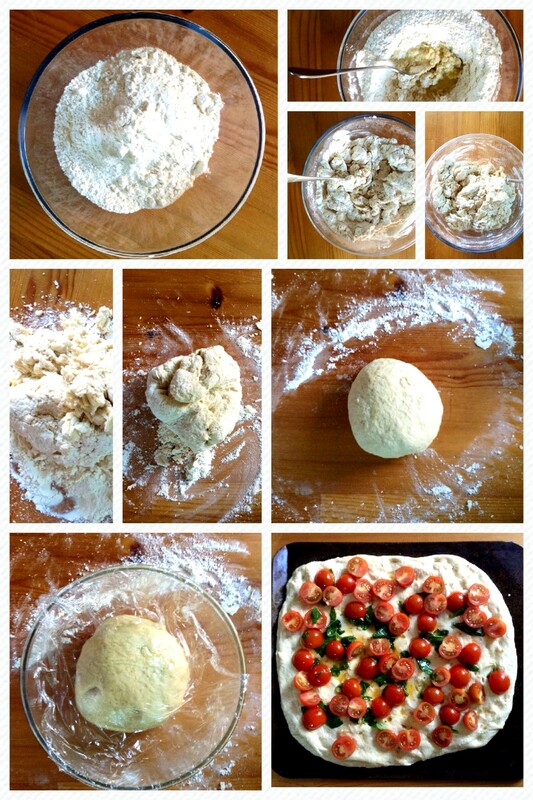 Looks great, and focaccia from scratch-scratch is not much trickier. Give it a try; you’ll be surprised.